Ben has teamed up with yMusic, an ensemble of six exciting instrumental musicians in their 20s and 30s with impressive credentials on both the pop and classical side. 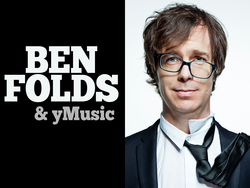 Ben’s “new band”, as he puts it, are putting the finishing touches on an album, to be titled So There (which will include at least parts of his concerto) and will be touring the US and elsewhere as Ben Folds & yMusic starting in mid-April; dates are still being arranged, though they’ve been booked to play the 2015 Bonnaroo Festival on June 12. The sextet, comprised of violinist and guitarist Rob Moose, trumpet and French horn player C. J. Camerieri, cellist Gabe Cabezas, flutist Alex Sopp, clarinetist and multi-instrumentalist Hideaki Aomori, and violinist Nadia Sirota released their second album, Balance Problems, late last year. Each has also recorded solo or with others in every genre from classical to jazz and pop. Ben heard about yMusic last summer and contacted them about a collaboration. He started writing music with them this fall, and the project evolved rather quickly into an album’s worth of material. The music is fresh and exciting – very pop-oriented, but with solid orchestral roots. The success of the collaboration inspired Ben to ask yMusic to tour with him in 2015. Although yMusic brings classical chops to the table, the album and shows will be more in the pop vein and will bring them to a variety of venues rather than mainly symphony halls. Update: Tour dates are being announced. Check the Tour Dates listings for details.